The screenings for Hail, Caesar! and Pride+Prejudice+Zombies was on the same night. I choose PPZ because I'm always fascinated by this ever present theme in our collective unconscious that one day we will no longer be worried about race, creed, politics or gender, instead the only separation will be Alive vs Undead! That, and I'm also a sucker for all the pomp, circumstance and genteel romance of a Jane Austen novel. I understand that Natalie Portman started the ball rolling on bringing "Pride and Prejudice and Zombies" to the big screen. That she loved Seth Grahame-Smith's book of the same name which parodies the 1813 British novel "Pride and Prejudice" by Jane Austen. I'm not a huge fan of Portman, except for her performance in Black Swan, but still I think this would have been a good vehicle for her. 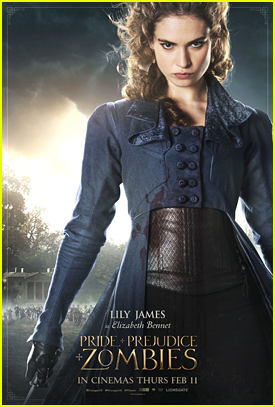 Although, newcomer, Lily James (Cinderella) made a perfect Zombie Slaying Elizabeth Bennet. I had no problem with the lighting and was quite impressed with the choreography of every zombie battle scene. Bottom Line: Is Pride & Prejudice & Zombies a Masterpiece? No. But director Burr Steers who also adapted the screenplay, does a fine job retaining the feel of "Pride & Prejudice" while keeping us off guard as to the next zombie attack. The sound effects are fantastic, I jumped and winced at every kill, not because the slayings were too graphic, but because boots smashing zombie skulls emits a horrid sound! It took me a while to feel Sam Riley as Mr. Darcy, I guess because Colin Firth is so firmly planted in my mind; However, by the end, I felt he adequately portrayed all the stiff pride the character is known for, while having a single minded determination to rid England of zombie scourge. Matt Smith as Parson Collins, a suitor and cousin to the Bennet sisters, is quite good at comic relief! The idea that most women of this time are allowed and encouraged to study martial arts and weaponry, rather than piano and sewing is amusing. Supposedly, women of the most Aristocratic families study in Japan, and those of less noble birth, study in China. 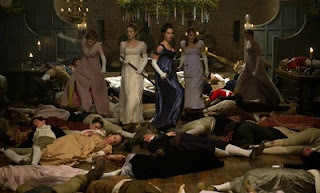 The Bennet sisters - Elizabeth (Lily James), Jane (Bella Heathcote), Kitty (Suki Waterhouse), Lydia (Ellie Bamber), and Mary (Millie Brady) - seem like delicate English country roses in empire waist gowns, until it's time to clear away zombies, strapping on knives and swords under their garters and firing pistols with precision, each sister's skill nearly equaling the next.